HUMANCAR INC. creates a car that doesnot require gas,generates its own electricity,and may charge power back to the grid. The vehicle seats four and generates power through a system of hand cranks. Yes, hand cranks.The next big thing in hybrid vehicles does not come from the likes of Toyota or General Motors. Instead, it comes from Charles Samuel Greenwood. Greenwood has been working on a human-powered vehicle concept for decades, and all of his hard work is coming together in the form of the HumanCar Imagine_ PS. Don't think that a hand-cranked vehicle would be marketable only as a neighborhood vehicle with a limited top speed. However, the HumanCar has surprising potential--a top speed of 30 mph going uphill and 60 mph on a flat surface. All of this can be achieved via human power and nothing else. As an exercise-enabled vehicle, it is possible for one, two, three or four people to operate the bi-directional human-power interface. Alternatively, a single operator may operate the vehicle in electric power mode only – or any combination of human and electric power may be employed. This zero-emissions vehicle is not only better for the environment; it improves the driver's health thanks to the workout you get while driving it. The human health aspect was part of Greenwood's decision to build and ultimately refine this concept. "It was 1968. Traffic was at a complete standstill, again, on a busy boulevard in what is now known as the Silicon Valley," Greenwood wrote. "Sitting within their cars were many commuters who were overweight and out of shape, breathing unhealthy exhaust fumes. As a young engineer working at my first job at a research and development laboratory for a major corporation, it seemed intuitively that there must be a better way to move people around than this." And with that, the concept for the HumanCar Imagine PS was born. The vehicle is street legal as a low-mass vehicle and is vehicle-to-grid (V2G) compatible. Greenwood plans to bring the vehicle to market next year but is already taking reservations on his website. 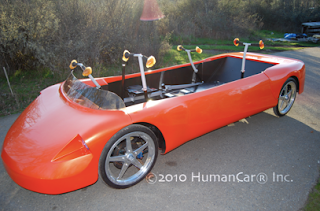 A $50 fully refundable, no-questions-asked reservation fee will put you on the list for a $15,500 HumanCar Imagine PS.